The Camino (meaning ‘Way’ in Spanish) is any route that pilgrims travel on towards Santiago de Compostela. Santiago means ‘St James’ and Compostela, ‘field of stars’. This city’s cathedral reputedly holds the remains of St James and has attracted Christians for over 1000 years. They have walked, rode and drove to ask for healing, intercession and forgiveness from no one less than one of the original apostles. In theory, any road will bring you to Compostela and many walk from their own front doors in mainland Europe to prove this point. Closer to Santiago there are, however, a handful of recognized Caminos that are way-marked with yellow arrows or scallop shells, and have hostels (albergues) and other services along the way. All Caminos make use of local paths, trails, tracks and roads, and wind through forests, farmland, urban areas and mountains. The Camino is an immersion in nature and the outdoors; beauty abounds. 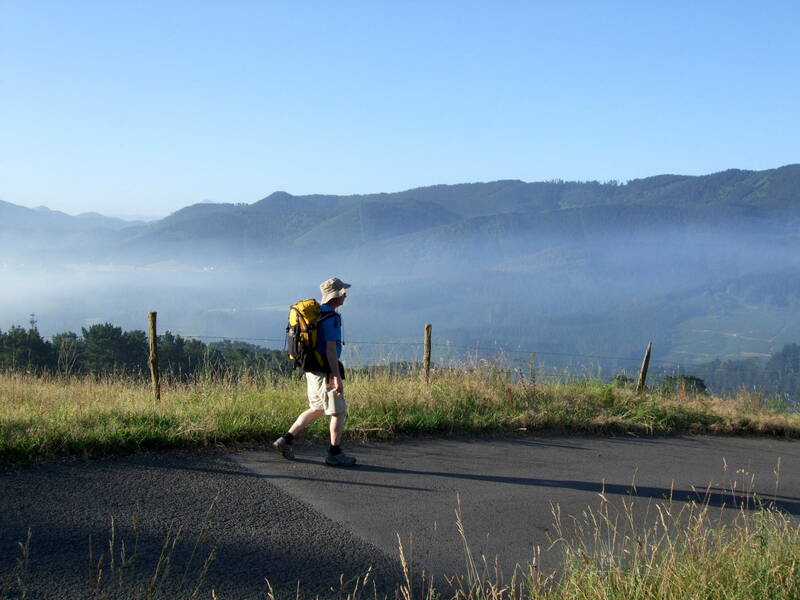 The Camino is much more than just a trail however; it is primarily an experience and a process. This means that the pilgrim walking the trail frequently meets their limits in terms of fitness, tiredness, and energy, and is forced into another zone where the experience of their humanity and vulnerability is humbling and often liberating. Unattended issues surface, and it often asks questions of their life, its purpose and meaning. As for Brendan, the process that happened on the trail was one of ‘hollowing out’, of being reduced to the essentials, and realising what was important. Some walkers describe this in spiritual terms, in terms of brokenness, atonement and redemption, but the process happens regardless of the language used. Often people walk the Camino for a purpose, to find themselves, to mark a significant event, or to mourn the loss of a loved one (as recounted here). The beauty of the Camino is that it provides the context, rituals and symbols for a staggering variety of people to find meaning in their experience. The sense of renovation felt afterwards is directly linked to the processing of this experience. This book sees the author on three Camino trails, those of the Camino del Norte (Northern Route), the Camino Primitivo (Original Route) and the Camino Francés (the French Route). Brendan starts off walking the much less travelled Northern Route (El Camino del Norte), 800 km west along the Atlantic coast from the French border. He chose it because, though short on infrastructure, it was much more rugged, rural and simple. There were relatively few people on this route compared to the French route, which was important to provide the time alone and silence that Brendan craved. The first part, from Irun to Santander, has the albergues on the coast and pilgrims climb up into the hills every day and descend again to the sea at night. The Basque farmland and forests make up a rich tapestry that is a feast for the eyes, but the altitude changes increase the effort required and makes it a very demanding if beautiful route. Albergues were often very basic with just a bunk and a shower, and no cooking facilities. Due to an injury, Brendan had to get help in Oviedo which meant leaving the Northern route and fortutiously was at the start of the Camino Primitivo (the ‘original’ or ‘first road’). Legend has it that King Alfonso II had a vision of stars impelling him to initiate this pilgrimage. King Alfonso II was the great defender of Asturias and apparently the first pilgrim to walk to Santiago de Compostela. He was the one who built the cathedral there over the remains of the Apostle James. 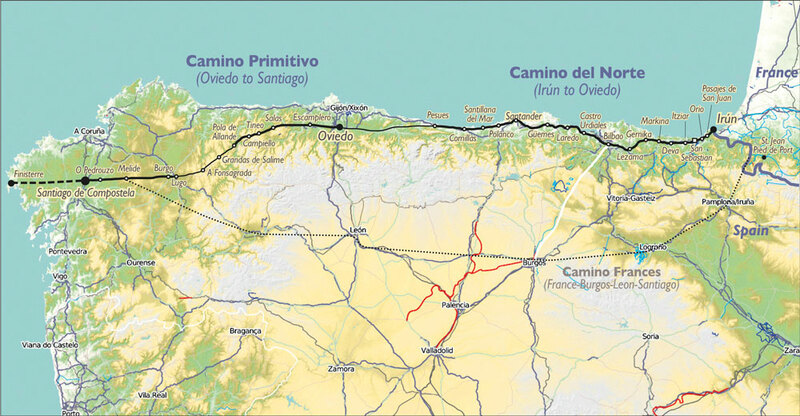 Called the Camino Primitivo , it is the ancient route that the author took from Oviedo to make up time as it dissects the Cantabrian mountains to get directly to Santiago. It was evident that this route is much older as the path was were sunken into the countryside and was often paved with cobbles or stones. The numbers of pilgrims walking this path were higher as Santiago is reachable in several weeks, not a month like the French route, and it offers some great scenery, culture and history along the way. The biggest difficulty is the range of mountains that have to be traversed, the ‘Roof of the Camino’, which tests all walkers regardless of age and fitness. This was Brendan’s biggest challenge, runing out of time and energy and facing huge mountains. The Camino Primitivo joins with the Camino Francés about 100km from Santiago. The Camino Francés is the most popular and well known of all the Caminos. It brings together a number of Caminos from France that would funnel medieval pilgrims through the Pyrenees and on to Santiago. The most common starting point today is St Jean Pied de Port near Lourdes, and from there, the trail winds on through the mountains to Roncevalles and Pamplona in Spain. From there it takes in great cities such as Logroño, Burgos (Brendan made a side trip here from Bilbao) and Leon. Brendan merged with the Camino Frances 120 km from its end, and the change was dramatic. Brendan encountered a great number of pilgrims, the hostels were huge and there was often a race to get places to sleep. The most significant thing about this final section is that numerous pilgrims complete only this last 100km in order to get the compostela, the certificate verifying that they have completed the Camino. Even though he’s only on this trail for a few days, it is an experience of crowds, commercialisation and development. This is all because of the Camino, a mixed blessing for sure. It is in stark contrast to the rustic simplicity of the Basque country coast where he started out. It does bring him into contact with the Mexican Alvarez family who turn out to be a godsend in getting him to Santiago. Their help is instrumental on that last day where Brendan has to drag himself into Santiago, at the end of his energy and endurance. The Camino runs on to the west, to the Atlantic, in Finisterre, in what is an extension to the Camino. This section is about 90km and finishes on Cape Finisterre, a rocky penisula that sits out on the sea, once thought to be the ‘end of the world’. It is here that Brendan sees pilgrims burning their clothes and it gives him the idea for a dramatic final ritual.